Ed and Charlene loved Crater Lake. We learned a new phrase today: Crater Lake Blue. 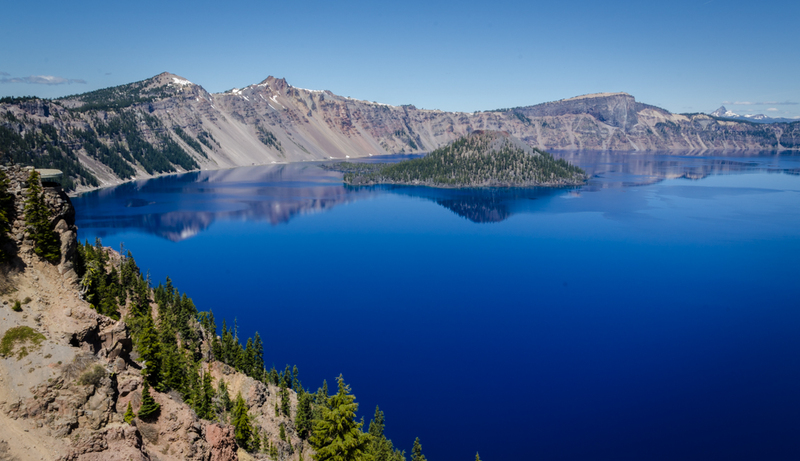 One glance at Crater Lake and it is very clear why people use the term Crater Lake Blue. Wow, is it gorgeous! The blue color of the lake is incredibly rich. When people first see it, you can hear them inhale as they are surprised by its beauty. Crater Lake is simply spectacular. 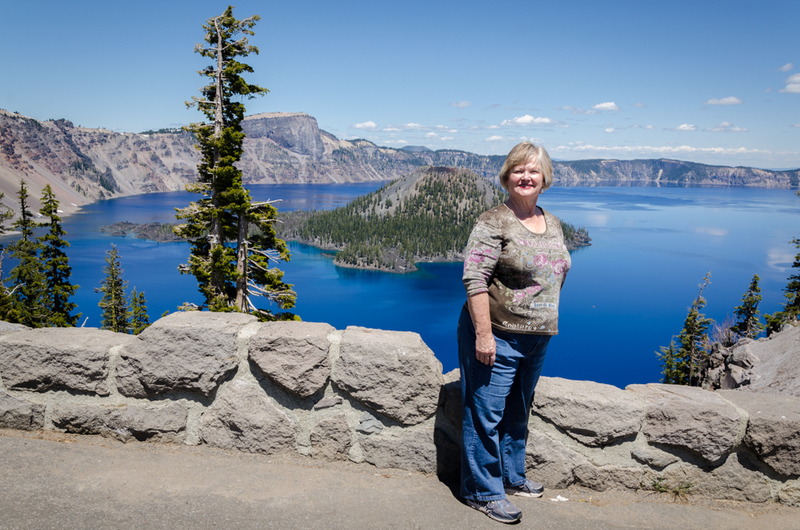 You can see in this photo why the “Crater Lake Blue” is now Charlene’s favorite shade of blue. Ed remembers in grade school that one of his teachers showed a movie that discussed Crater Lake. Now all these years later, we were able to see it in person. Viewing Crater Lake is truly inspiring. We learned all kinds of interesting facts. 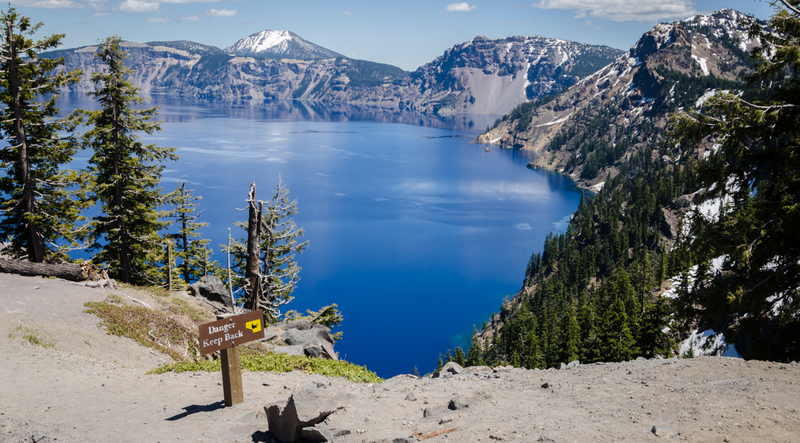 Crater Lake is the deepest fresh water lake in the entire United States. It started when a volcano erupted. A chasm formed in an almost perfect circle around the entire volcano. When the eruption was done, the entire mountain fell into the earth creating an immense bowl. Since the area averages 44 feet of snow every year, the bowl filled with snow and rain water. There is no other source of water for Crater Lake. Therefore, the water is pristine. Tests are run every year to determine the depth of visibility. The average is 100 feet. Charlene with Wizard Island in the background. There is one type of bird that is abundant around Crater Lake. It is the Clark’s Nutcracker which feeds on seeds from pine cones. Any seeds not eaten immediately are stashed and those forgotten grow into new trees. The nutcrackers are beautiful, but noisy. Crater Lake is definitely a place to put on everyone’s bucket list. The sides all around the lake are very steep, just like a bowl. It is a huge bowl of the purest water in the country. This is a panorama of 4 separate photos to fit the entire lake into one photo. When we got back to our motorhome, we saw an egret walking carefully and slowly in the stream next to us. Beautiful! Occasionally it would stop and swiftly dip its head into the water and come up with something to gobble. We also saw a family of ducks. When we opened the door, the males flew away and the mother stayed with the ducklings which instantly swam next to her under some plants growing over the water. This egret was right outside our motorhome door. Beautiful! This has been a wonderful place to boondock. It will be sad to leave this place, but it will forever hold good memories for us.